I watched a fascinating TED Talk the other day, it was given by Sebastian Seung, an MIT scientist who is mapping the human brain. He is focusing on the mass of connections that span the spaces between our neurons, and calls this mass of cerebral wires the ‘connectome’. Seung suggests that our personality and memories may lie within these connecting cerebral threads. This got me thinking about memory and how our brains are like sieves; I am not thinking about what the sieve loses rather than what it seeks to keep. That is, our brains are dainty filters capturing useful little thoughts from the torrent of information pouring through our minds. The best way to remember things seems to lie in finding connections, by linking items to each other we increase our recall quotient. One way of connecting ideas about the Web is by using the Web for memory capture, and though blogs require effort they are wonderful tools for building all manner of connections. Those quick ‘Bookmark‘ and ‘Tag This’ buttons provided by various applications embedded on my browser tool bar mean I can store links to all manner of articles while expending very little effort. In turn, the less thought used to record the link, the less useful the bookmark finally ends up being to me… not to mention the fact that I bombard myself with so much information I end up bookmarking items instead of reading them. However, if I mention an article in a blog post it helps me to recall it years later. I usually add in images to illustrate a post and this helps to glue the ideas and articles into my memory. In effect, the activity of blogging helps me remember things. Blog tools such as tags, categories, calender and archive provide additional mental hooks. Categorizing and tagging encourage me to clarify my ramblings whilst also providing routes and connections which help retrieve those same thoughts later. 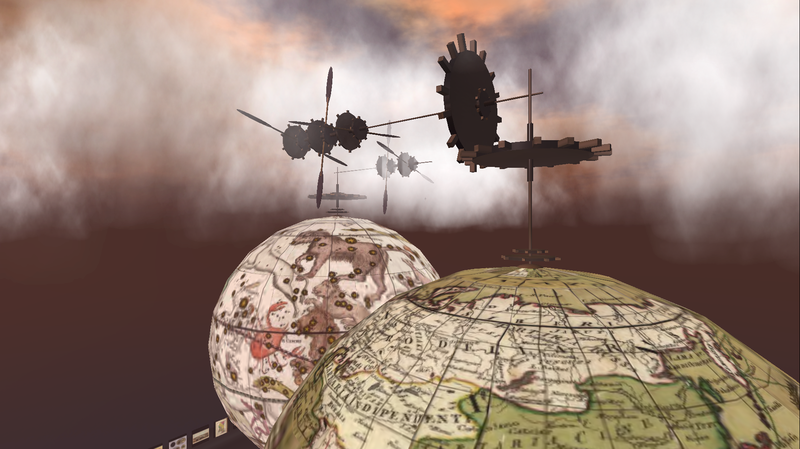 Now, those who travel in the 3D web of virtual worlds know these worlds provide wild and wonderful images which they can fly around and explore, images that are far more interesting than clipart and Google images. In other words, Second Life, InWorldz and other blossoming digital realms provide us with an extraordinary 3D sketchpad if we so chose. The World and Celestial Globes of Giovanni Maria Cassini on display at Rumsey Maps (note you can fly your avatar right inside these globes). Of course, writing is also an important part of blogging, though oddly enough expressing yourself in words does not have to be the priority. Bloggers blog in many different ways; blogs can be a list of links, a store of images, short pithy paragraphs, bunches of quotes etc. Still, for me writing helps me discover what I am thinking as sometimes I have only a vague notion when I start typing. I hand write notes to myself, scrawling with such horrible handwriting that sometimes I can’t even read it later. These notes save ideas in their early stages i.e., the idea is outlined but it is not fully explored. When I return to read it (or at least try to read it) I often find I have lost the original insight and energy that prompted the note taking in the first place. Blogging makes these rambles available for viewing by an unknown audience of strangers, awareness of this shadowy crew is enough to encourage me to tidy up my thoughts. Ultimately, the person who writes the post writes to themselves in the future. That is, the anonymous others who might read a blog post includes the writer as well. I admire R.B. 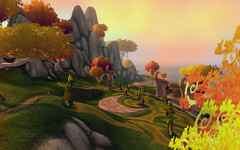 Wild’s Great Map blog, he keeps things very simple generally just using quotes and links to items that have attracted his interest. 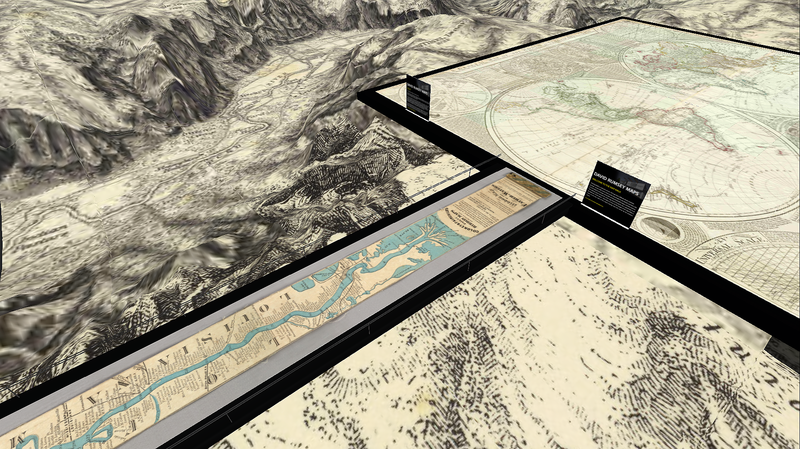 He is fascinated by maps and his blog is his map through cyberspace. This blog is called Cyberloom because I see myself as a space weaver. This is a little tongue in cheek, it comes from the days long ago when I was a recently graduated graphic design student in the UK. The professional designers I was in contact with (at that time) viewed self expression as self indulgence, and they called artists ‘basket weavers’ (and not in a complimentary tone). This blog weaves together a trail of thought threads, and virtual world photographs, to create a small personal memory mind map of the vast, ever growing, digital vacuum known as the World Wide Web. 3 antique maps: 'A Ribbon Map of the Father of Waters' connecting to a 'General Map of the World and Terraqueous Globe' and floating above the 'Topographical Map of the Yosemite Valley & Vicinity'. 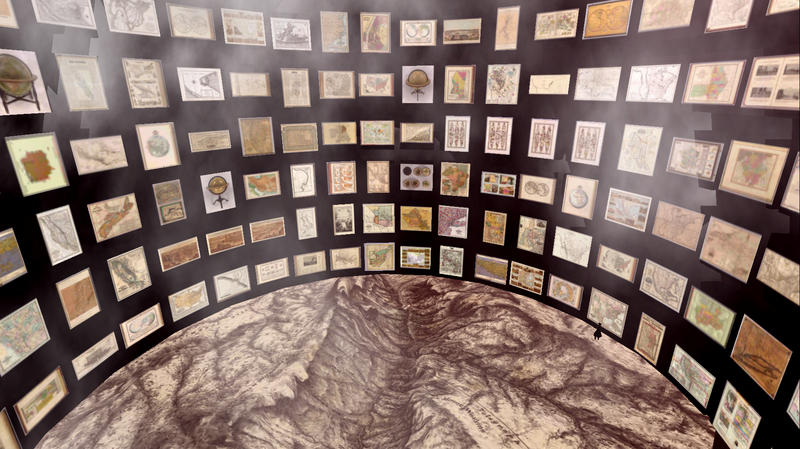 All images taken on David Rumsey Maps in Second Life. 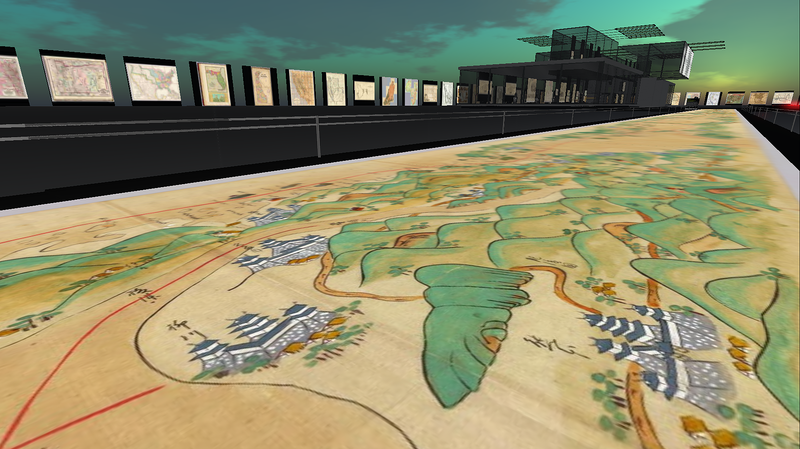 Also please see the online David Rumsey Map Collection.